Monique Lhuillier: Love, love, lover her use of navy blue. The world needs more of it. Period. These pretty patterns remind me of the coveted blue/white ginger jars. I was hoping for more pieces to gush over from Monique but this time around was only so-so for me. 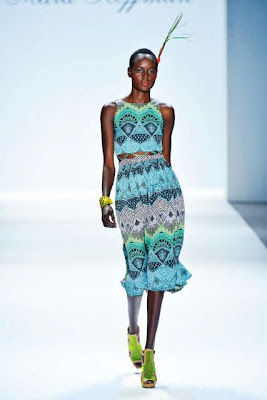 Nevertheless, two thumbs up for her use of navy and turquoise on the runway. She always has the perfect silhouettes too. Lela Rose: First, can we talk about the color? I also like how she's updated the one shoulder look by adding a sleeve (left) or having it just slightly off the shoulder (right). The dresses are also very flattering around the waist area. Erin Fetherston: The simplicity of these looks give them a certain elegance that I really like. Of course, I'm also digging the peach and coral colors. How gorgeous are those ombre dresses on the left? 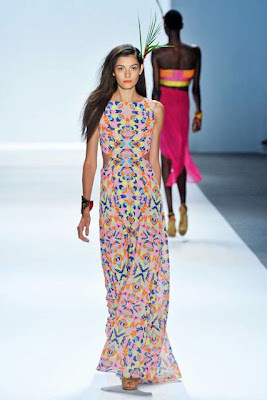 DKNY // Diane Von Furstenburg: Two designers that never disappoint. The black leather dress (left) by DKNY is a look that could cross generations. I could see a woman in her 20's wearing this as well as someone in their 40's. The white DVF dress on the right showcases the delcollete, which again is flattering for most any age. Nicole Miller: These fun little dresses caught my eye not only because of their pretty patterns but because of their cut. The solid black peplum skirt (on the left) is so forgiving and the way the floral fabric meets the solid blue fabric (on the right) is a great way to slim the hips and waist. 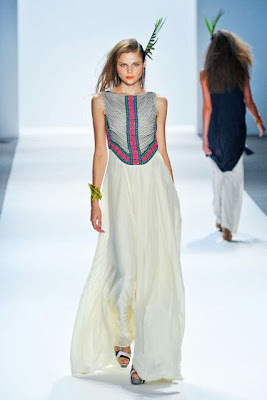 Mara Hoffman: Okay, my absolute favorite collection that I've seen so far! I loved almost every piece. The bohemian style mixed with bright pattern is so, so fun without being over calculated. 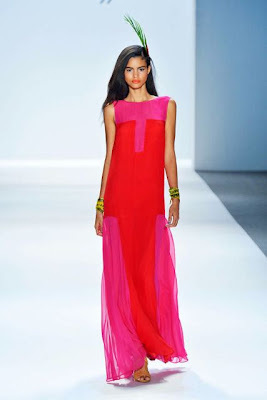 Mara Hoffman again...if I could spend all of spring 2013 in that red/fuschia dress, I may consider giving up my entire fall season! 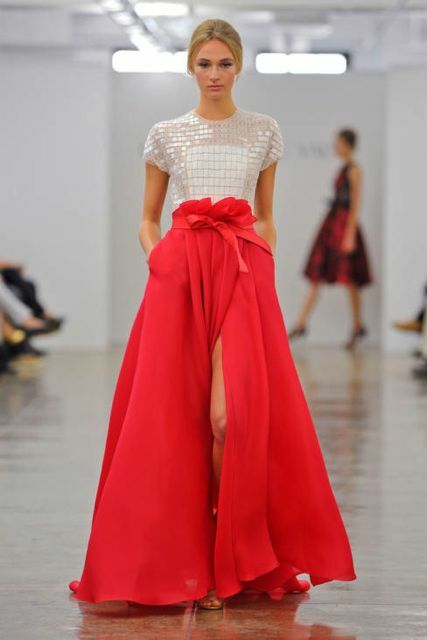 Carmen Marc Valvo: I adore this red dress because of the way it mixes masculine and feminine. The combination of the hard, futuristic top with the flowy, romantic red skirt speaks right to my heart. I also really like this little black/grey piece. It has the feel of a jumpsuit (could be shorts underneath) which would be easy to dress up or down depending on the occasion. Backyard pool party anyone? Marissa Webb: Former head of womenswear design for J Crew had her first solo appearance at Fashion Week and I'm totally liking her style. These short suits are absolutely adorable. Not sure I could pull of the leather short but I love the idea of it. The look on the right is a bit more of a classic twist which makes me want to keep an eye on future collections from Marissa. 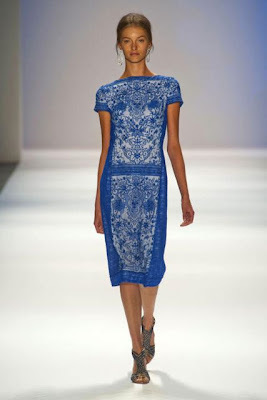 Tadashi Shoji: I like the eastern influence in this collection. These pieces remind me of the beautiful saris worn in Indian culture and I'm happy to see the lace trend still going strong. The colors are spot on as well. 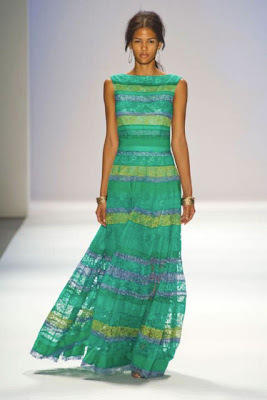 So, there's my recap of Fashion Week Spring 2013 thus far. Do you have a favorite or is there an amazing designer that I missed? Weigh in now! On that note, I'm gonna go eat a few biscuits. Looking at all these thin, gorgeous models has made me hungry for breakfast. I agree, more navy please! Love the navy and again the bright colors! Went to the Jason Wu show and it was spectacular!!! Thanks for sharing these, look forward to seeing them again in the spring! I am excited about navy again. One of my friends is covering it as a photographer. @Christy- Lucky girl! I love Jason Wu. Maybe I'll actually make it to fashion week one day! @Ruth- What a fun subject to cover as a photographer! Can never get enough of navy. So beautiful - I need helpful around the waist!